I haven’t really thought about removing it. I used to smell it often, letting memories run over me like water. If I closed my eyes long enough, it’s almost like I could feel him in the shower with me. Almost. This may sound funny, but Jon always smelled good. I loved the combined aroma of his deodorant and cologne, and I loved the smell of his hair, and the scent of his skin after a shower. Sometimes I lay curled behind him while he slept, just enjoying the closeness and memorizing the way he smelled. I guess smells are powerful things for me. For months after he died I would bury my face in his dress shirts. I wept the day they no longer smelled like him, staining the sleeves with tears and mascara. It’s been a long time since I opened his shampoo. But today I ran out of my own. So I opened the cap and let the royal blue liquid fall to my palm. The reaction was visceral, a return to the type of ache known only by those who have experienced death. I let the memories come. As I lathered my hair, the tears came too. I leaned hard against the shower wall, sobbing. Grief no longer has a stranglehold on me, and it’s been a season of peace and rest. Yet, my friends who’ve walked this path before me are wise in their counsel. They’ve said that it doesn’t truly end. We can often put it away like winter coats when spring comes. We enjoy the delights of warmth and bask in the sunny weather. But sometimes we take those coats out and put them on in the middle of summer. Sometimes we need to ache and sob again. It’s not a bad thing, as some would have us think. Rather, It’s another occasion to be deeply aware of the Comforter, to know that mingled with my sobs He pleads with sobs of His own, with groanings to deep for words. It’s an occasion to remember my Father is perfect. He loves, provides, cherishes, and gives His children only good gifts. It’s another occasion to acknowledge our neediness before a God who knows our frames and remembers we are dust. It’s a time to boast in our weakness as the apostle Paul did. Strength is not refusing to be weak. Strength is resting in the power of Christ when weakness threatens to undo us. So let the memories come. Your God is big enough for weakness. 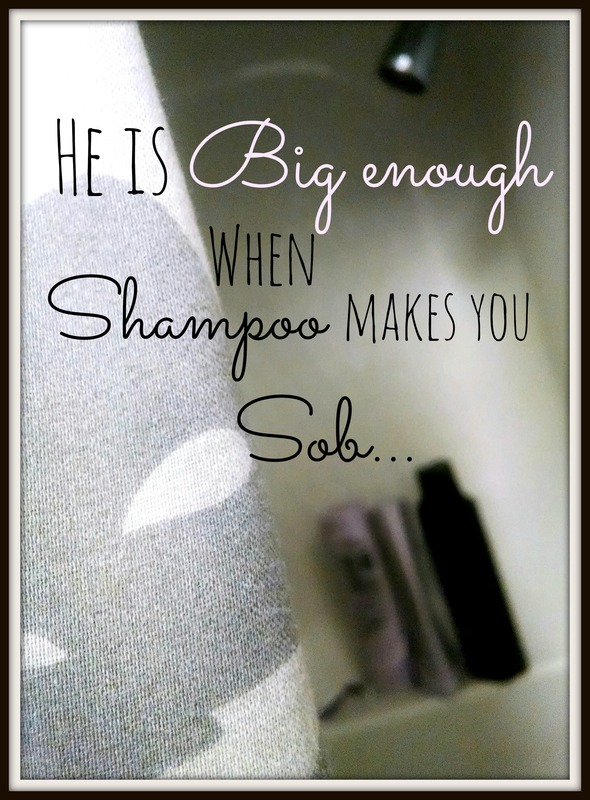 He’s big enough when shampoo makes you sob. Holy Spirit you are my Comforter. How incomprehensible is your tender care. How overwhelming to think about how you pray for me. I’m utterly dependent on you. I’m weak. But you are big enough. Your grace is sufficient. < Previous Life or LIFE?